The Fethard Historical Society, with Rachel Murphy, received Heritage Council funding as part of #EuropeforCulture and #MakeAConnection to create a Digital Atlas of Fethard using ArcGIS from Irish Historic Towns Atlas no. 14 Fethard by Tadhg O'Keeffe, originally published in 2003. Phase one, to transcribe the topographical information into a GIS-friendly database, took place in Patrician Presentation Secondary School on Saturday 9 June 2018. Volunteers signed up to be part of transcribeathon that was hosted by Mary Hanrahan, chair of the Fethard Historical Society. 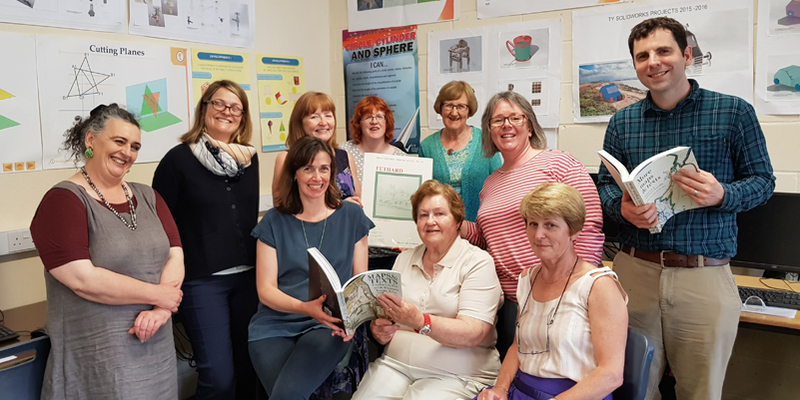 Sarah Gearty of the Irish Historic Towns Atlas gave an introduction to how the topographical information works and Rachel Murphy explained how this information can be used in a Geographical Information System (GIS). The Digital Atlas of Fethard will follow on from similar prototypes for Derry~Londonderry and Galway, but will also feature artwork from the students of the Patrician Presentation Secondary School. We would like to acknowledge the funding from the Heritage Council as well as the work carried out by the Fethard Historical Society and the volunteers to get the project successfully past phase one. The launch of the Digital Atlas of Fethard will take place on 24 August 2018 at 6pm. Details will follow here.